Castor oil doesn't have a lot to recommend it at first glance. It's practically the texture of molasses, it has the troubling distinction of being the only beauty product to have been used as an instrument of torture in fascist Italy, and it's, you know, oil — the idea of putting gobs of it on your skin, especially to someone who is somewhat acne-prone, is counter-intuitive. But castor oil is nonetheless totally amazing. It's pressed from the seed of the castor oil plant. (The seed also contains the highly toxic substance ricin. You remember the Soviet defector journalist who was killed in London by the KGB spy who stabbed him in the leg with an umbrella? Ricin. Which I guess is yet another apparent strike against good old cold-pressed C.O., even though no ricin persists in the actual oil.) Castor oil is an active ingredient in tons of cosmetics and skin products, everything from shampoo to lip balm, including some really expensive brands, so chances are you're already putting it on your body. 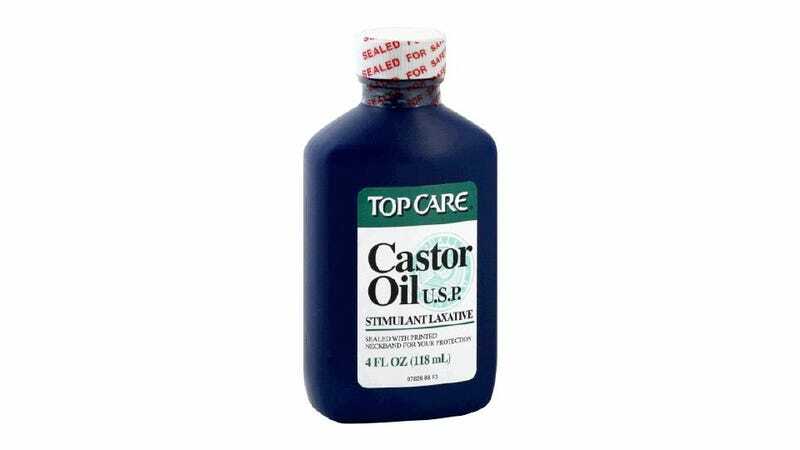 A few years ago I decided to cut out the middleman and just use castor oil straight. (At the time, I was experimenting with the oil cleansing method, which didn't work for me, but did thankfully introduce me to castor oil.) You can get fancy castor oils at health-food stores or online; I always go for the cheap stuff in the laxatives aisle at the chemist's. Various claims have been made about castor oil's effectiveness at everything from stimulating hair growth to diminishing wrinkles to being a mild anti-fungal agent to being an anti-inflammatory (ricinocleic acid does indeed have anti-inflammatory qualities). I like that it moisturizes my skin without leaving it greasy or blocking my pores. It penetrates really deeply, and my skin absorbs it almost instantaneously — there's no "oily" after-feeling. I use it as a first resort if I ever have any patches of red, irritated, flaky, or dry skin, or if I have any superficial cuts or scratches; it's soothing and generally heals the problem in a day or so. I rub it into my hands and feet each night before bed. I use a tablespoon or so as a body lotion after the shower. It's thick, so I don't put it on my face (except for a nightly dab on my eyebrows, and whatever trace amounts of the oil are transferred when I touch my face with my hands). But for everything else, you'll hear no complaints from me. Castor Oil, 4 oz., $1.69 at Wegman's.